introduce patients to the Pauir Workout Top. It’s simple: working out daily can increase chances of breast cancer survival by 50% and decrease recurrence by 50%. * But if your patients can’t get into a workout top because of shoulder and arm pain/immobility from radiation and surgery, deflated motivation and confidence can result in less chances of working out. Our founder and CEO Jamie Hoffpauir felt the pain your patients now feel, struggling on the floor to suit up to exercise, screaming at the tops that—once her go-to as a fitness enthusiast and professional—blocked her from her place at the gym. NO MORE. Just slip our 2-sided promo cards into your treatment packets telling your patients about the benefits of exercise and how the Pauir Workout Top can help: no raising arms—it slips on like a jacket. And your clients simply order directly from us. 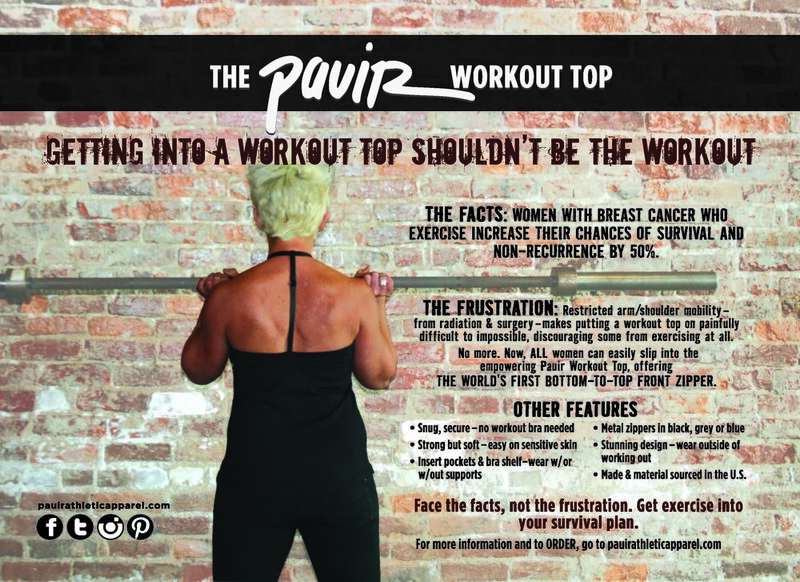 Besides zipping on easily, the Pauir Workout Top features other benefits to resolve more issues breast cancer patients and survivors face. Learn more about them by clicking here. contact us for your center's cards. Free.